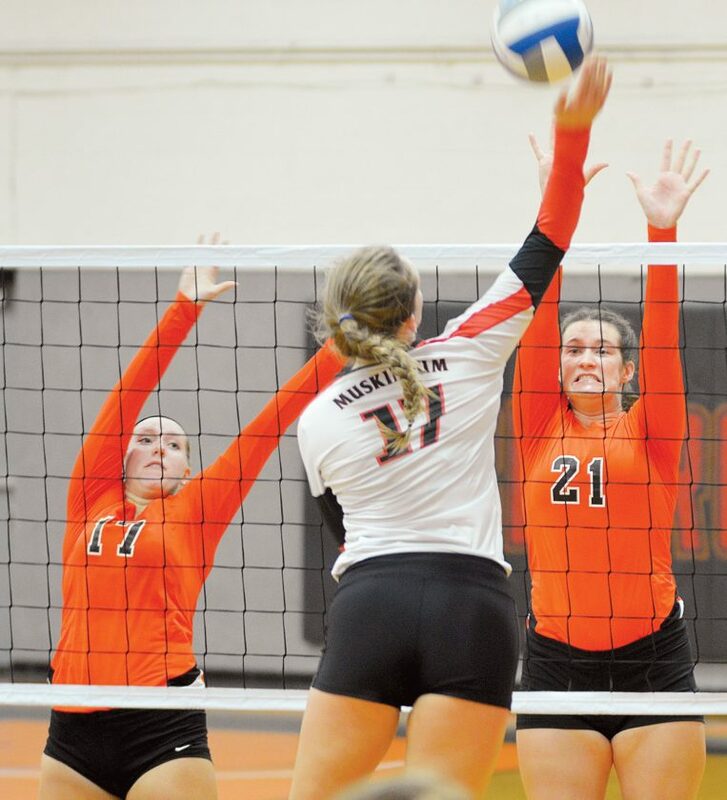 PHOTO BY JILL GOSCHE Heidelberg's Morgan Strenk (left) and Sarah Parker, a Mohawk graduate, attempt to block a hit by Muskingum's Chloe Brandewie during the match in Seiberling Gymnasium Tuesday. Mariah Sullivan smashed a career-high 19 kills and Heidelberg overcame a first-set setback Tuesday to beat Muskingum in the Ohio Athletic Conference quarterfinals. The Student Princes dropped the opener 25-17 before taking the next three games 25-17, 25-21, 25-23 to improve to 22-8. Heidelberg will host No. 3 seed Mount Union in the semifinals Thursday at 7 p.m. The Muskies (15-14) looked to be on their way early, jumping out 11-2 in the first game en route to the opening win. That included the Student Princes. Heidelberg used a 7-2 run in the second game to even the match, then overcame a 21-18 deficit in the third set by scoring seven straight points to gain momentum. Sarah Parker hammered four kills during that crucial stretch. Muskingum battled back from a three-point deficit in the fourth game to knot the score at 23, but back-to-back kills by Janessa Scott and Laura Schragg gave the victory to The ‘Berg. Parker backed Sullivan with 18 kills and Scott slammed 11.Karlie DiRuzza tossed up 51 assists and had 13 digs, Rachel Raimondo came up with 22 digs, Megan Mills added 13 digs, Sydney Moore chipped in 11 digs and Morgan Strenk ended with nine digs. GALLATIN, Tenn. — Tiffin University improved by four strokes on the second day to claim second Tuesday at the Trevecca Nazarene Invitational at Foxland Harbor Golf and Country Club. McKendree held off the Dragons 600-608 for the championship, with rival Ashland shooting a 609 for third and Southern Indiana taking fourth with a 610. Jay Green and Tyler Schepens tied for 11th overall, shooting identical rounds of 75 on the first day and 74 on the second for a 149 for TU. Logan Price added a 150 (76-74), Brett Green carded a 153 (79-74) and Tomas Krivanec had a 158. ASHLAND — Ashland battled past Tiffin to claim an 18-25, 25-17, 23-25, 25-18, 15-13 Great Lakes Intercollegiate Athletic Conference win Tuesday. The loss snapped TU’s four-match win streak and marked the second time this year Ashland beat the Dragons in five sets.Casey Clark, Kayla Pfeiffer and Alli Cudworth each tallied a double-double to lead the Eagles (17-8, 8-5 GLIAC).Clark registered 19 kills and 11 digs, Pfeiffer had 46 assists and 12 digs and Cudworth turned in 12 kills and 11 digs. Shelby Woycik backed them with 12 kills, Melanie Aguayo had 10 digs and Kaitlin Bean finished with nine digs. The Dragons (16-11, 6-7) got 13 kills from Mohawk graduate Kasey Adelsperger, and 43 assists and 6 digs from Buckeye Central product Emily Weithman. Danielle Hicks hammered 11 kills, Jenna Huffman chipped in 10 kills, nine digs and eight block assists, and Olivia Cobb had eight digs and seven kills. Taylor Lattimore backed them with 24 digs.